IS THE Löwchen RIGHT FOR YOU? The Löwchen is a rare breed known for their friendly, happy, playful, and intelligent nature. The Löwchen makes a good pet for families with children. The Löwchen, or Little Lion Dog, dates back to the 16th century in Belgium, France, and Germany. Their name comes from the way they were groomed back in the 1500s, and not based on their natural appearance. These tiny dogs used to be popular companions for families, but like many breeds after the World Wars, this breed was almost wiped out, earning them the title as the rarest breed on earth by the Guinness Book of World Records in 1960. The Löwchen was recognized by the AKC in 1996. The Löwchen, or Little Lion, has a robust mane, and is often groomed to accentuate that lion-esque look. The Löwchen has a short, broad head with an equally short muzzle that is covered in long fur. They have a black nose and dark, deeply set eyes. Their low, short body is proportionate, but small, and their tail is medium in length and normally carried high. Their coat is long, wavy, and soft. 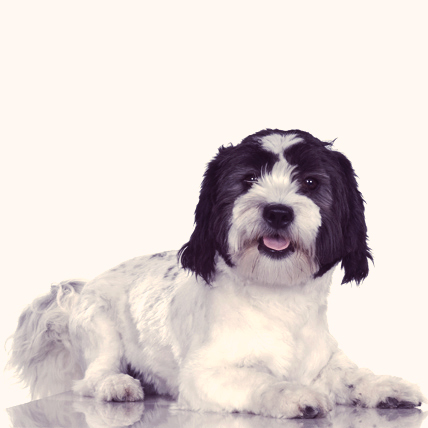 A chipper, playful, loving, smart breed, the Löwchen loves to learn new tricks and explore. Thanks to their natural inclination for learning, they are especially easy to train. They are great with kids, other dogs, and non-canine animals too, although they may try to take on a dog much bigger than themselves (and oftentimes winning). The Löwchen is tough for a tiny dog, and makes for a great watchdog, being in no way shy about using their voice. The Löwchen can be found in white, black, spotted, cream, ivory, or yellow.